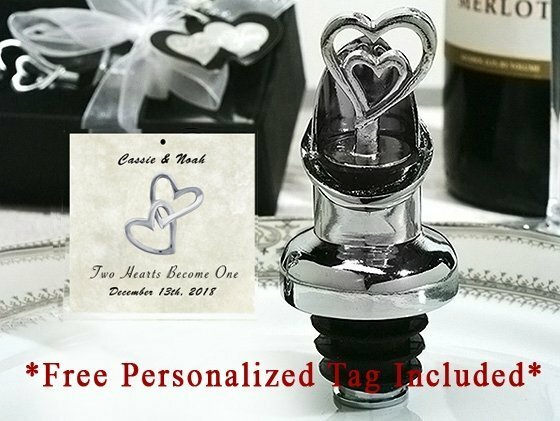 "Two Hearts are better one" and you are the perfect combination, and so are these combination wine pourer, wine stopper favors. They make the perfect gift for your elegant affair. Each elegant Solid chrome metal Wine pourer is adorned with a Two open hearts design stopper. These favors will remind your guests of the perfect combination you are every time they sit down to enjoy their favor vintage. Can I have these wine stoppers engraved? 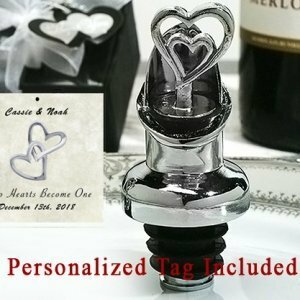 Unfortunately, we don't have an engraving option for the Personalized Two Heart Wine Pourer Bottle Stopper Combo but you can personalize the tag. You can select a design from our list and add a text, with maximum of 20 characters.